I’m proud to introduce Michael F. Smith as today’s featured author. He is a writer and teacher of creative writing at my alma mater, Mississippi University for Women in Columbus, MS.
His novella, The Hands of Strangers, is the most heart-wrenching, fantastically written novella about the uncertainty of knowing whether or not your child will ever come home to you. It follows the two parents, Estelle and Jon, as they search for their daughter in Paris. But it’s not just about the search. It’s about these two characters and how they deal with the tragedy that has befallen them. I’m a Mississippi boy, but have been fortunate to live around the country some, and abroad, so being back in Mississippi has been a roundabout thing. I live in Columbus, MS with my wife and two young daughters. “The Hands of Strangers” is a haunting tale of what every parent dreads: their child vanishing. What was your inspiration? Was this written before you had children of your own? The inspiration came from a strange, sad moment. I was in the Paris metro and in some of the bigger metro halls, there are public boards where people put up flyers for concerts, new stores, bars, and so on. As I was walking past one of these, I saw a homemade flyer that said, “Please help us find our daughter,” and it included a black and white photo of a young girl. It stopped me and really struck me in an emotional way. Days went by and I couldn’t stop thinking about it, so I sat down and wrote a short story titled “Anywhere” that was my imagining the father, walking through these metro halls, with a duffel bag full of these flyers. I just went on from there. And, yes, I wrote this story before I was a father. Later, when I went back to make it a larger work, our first born came along. It made it a more difficult, more emotional project. I’d never have written the original story if I would have been a father. How did your travels help inspire the setting of your novella? Paris has had a major impact on me. I think that’s obvious in the story. It’s been a place that has always intrigued me, inspired me, and I’ve been fortunate to spend the kind of time there that you need to get a feel for a place, and to find your own neighborhoods and cafes and bars, and to get a sense of it all. I just got back from a visit there, the first time I’ve been back since I wrote The Hands of Strangers, and it was very surreal walking the streets, kind of looking around for my characters. How did you settle on a novella-length story as your debut? It just kinda happened. I kept thinking about Jon and Estelle, the parents in the original story, and it just seemed I wanted to know more about their lives. So I sat down and started chapter two where “Anywhere” ends. I wrote until I simply felt like I’d told their story and I stopped. It just happened to land as a novella. But some of my favorite books are novellas, The Stranger, The Old Man and the Sea, The Ballad of the Sad Cafe. It’s a wonderful form. What are your writing habits? Do you have a certain routine, or do you write when you have the time? I used to be a habitual morning writer. Get up, get coffee, write for an hour or two before the day gets going and all the anxiety of real life bite at you. But having two daughters has changed that routine. Mornings are a hustle most days and it kinda takes me out of the mind set I need to work. Some days I can still work in the mornings, but I work more at night now. It’s basically when I find some hours, or hour, and take advantage of it. What was one of the most surprising things you learned about yourself or your writing while creating this novella? That’s a good question. That’s a tough question, actually. I think the most important thing I learned was that I could go beyond a short story. I’d only written short stories up until then, and I wanted to make the move towards writing novels, and that proved to me that it might be possible. Are you working on any other projects? If so, when can expect something new from you? I have a couple of novel length manuscripts going through some fine tuning right now. I’m hoping next year will deliver a new novel to the shelves. Looking to buy Michael F. Smith’s novella? Check out his website here for information to buy online and in local bookstores. Like Michael F Smith’s fiction on Facebook. For other interviews, upcoming events, and more follow his site at http://michaelfsmith.com. Michael F. Smith is a native Mississippian who has lived throughout the Southeast and spent considerable time living abroad in France and Switzerland. He has been awarded the Mississippi Arts Commission Literary Arts Fellowship, the Transatlantic Review Award for Fiction, the Alabama Arts Council Fellowship Award for Literature, and the Brick Streets Press Short Story Award. His short fiction has twice been nominated for a Pushcart Prize and his fiction and non-fiction have appeared in numerous literary reviews and anthologies. He has been invited to read his work at multiple venues, from Boston to Manhattan to Montrichard, France. 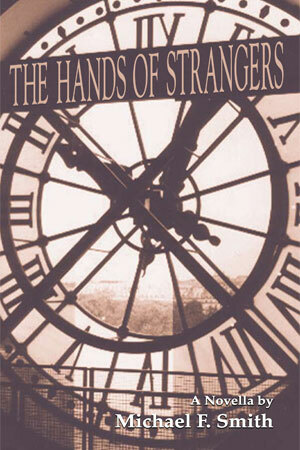 His first novel, The Hands of Strangers, is now available from Main Street Rag Publishing in Charlotte, North Carolina. He attended Mississippi State University and later the Center for Writers at Southern Miss. In between, he took his first job with the NBA, working with its outdoor streetball festival, Hoop-It-Up. After only a few months in Dallas, he jumped at the opportunity to move to Western Europe and work on the road crew with the European version of Hoop-It-Up. Over the next few years, he traveled extensively in Western Europe, working in and visiting the countries of France, Italy, Spain, England, Germany, Greece, Denmark, Switzerland, and more. It was during this time, riding the trains, and spending evenings at his apartment without the luxury of television, that he began to read, and read some more. Which then led to the idea that he’d like to try and write some of his own stories. His own work is naturally influenced by Southern writers – Larry Brown, Harry Crews, Carson McCullers, Truman Capote, Flannery O’Connor, Tim Gautreaux, William Gay, Barry Hannah, William Faulkner, and so on. Like most writers, his beginnings focused on the short story, but in the last few years he has turned towards the novel and The Hands of Strangers is his first published novel.